The Framingham Offspring study found that 39 percent of the general population may be in the low normal and deficient B12 blood level range, and it was not just vegetarians or older people. Follow this link for more detailed reports about Vitamin B12 supplements being given to farm animals. 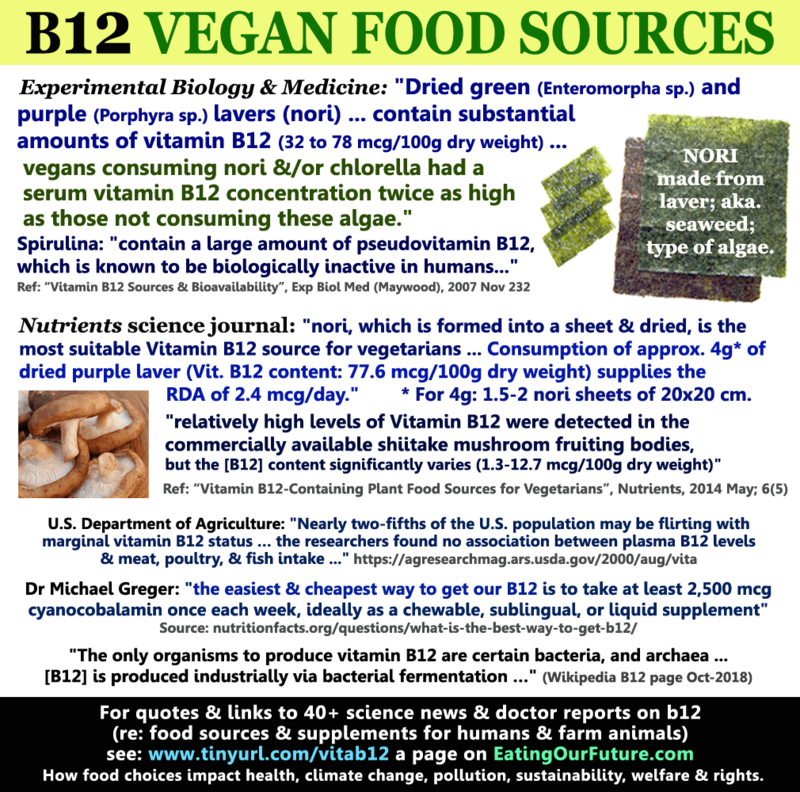 “Safest Source of B12” is a 2012 article by Dr Michael Greger M.D. – Excerpts: “What’s the best way to get vitamin B12? Well, B12 is not made by plants; it’s not made by animals either. It’s made by certain bacteria, some of which line the guts of animals, of which people eat and drink. But that’s not the best source, because of the baggage that comes along with it. Regards B12 in mushrooms the Journal of Nutritional Science and Vitaminology: “This study determined the vitamin B12 content of six wild edible mushrooms which are consumed by European vegetarians. Zero or trace levels (0.01-0.09 µg/100 g dry weight) of vitamin B12 were determined in porcini mushrooms (Boletus spp. ), parasol mushrooms (Macrolepiota procera), oyster mushrooms (Pleurotus ostreatus), and black morels (Morchella conica). By contrast, black trumpet (Craterellus cornucopioides) and golden chanterelle (Cantharellus cibarius) mushrooms contained considerable levels (1.09-2.65 µg/100 g dry weight) of vitamin B12. From the results section: “These results indicated that black trumpet (C cormicopioides) and golden chanterelle (C. cibarius) mushrooms contained considerable levels of authentic B12, but not pseudo B12 that is inactive in humans. Thus, black trumpet and golden chanterelle mushrooms could be useful plant B12 sources for vegetarians. Journal of Nutritional Science and Vitaminology (2002): “Substantial amounts of vitamin B12 were found in some edible algae (green and purple lavers) and algal health food (chlorella and spirulina tablets)… Corrinoid-compounds were purified and characterized from these algae to clarify the chemical properties and bioavailability of the algal vitamin B12. TRUE VITAMIN B12 IS THE PREDOMINATE COBAMIDE OF GREEN AND PURPLE LAVERS AND CHLORELLA TABLETS… THE RESULTS SUGGEST THAT ALGAL VITAMIN B12 IS A BIOAVAILABLE SOURCE FOR MAMMALS. From “Vegan B12 deficiency: putting it into perspective” a 2011 article by Dr Michael Greger MD – excerpts: “Yes, eating a healthy plant-based diet may make us “heart attack proof” but, some ask, what about vitamin B12? “How much B12 should I take? For the general adult population, a daily dose of the smallest available tablet of B12 (usually 100 mcg) should be sufficient. You require just a few micrograms a day. Your body will absorb only a very small part of that pill. The reason for this low absorption is that there is only enough intrinsic factor (the body’s chemical that shuttles B12 into your gut cells) excreted per meal to absorb 2-4 micrograms of B12. In addition, your body absorbs B12 by passive absorption, but it does this with only perhaps 1% of the total dose you consume (the percentage decreases with higher dosages). I suggest a dosage just high enough to give you a nice low-average level of B12. I do not suggest B12 for anything other than to prevent deficiency. What form B12 should I take? Personally, I don’t really advise any particular form. You can take cyanocobalamin or methylcobalamin. Both have been shown to increase B12 levels. If any readers have seen primary research (ie. not a webpage like this one) that suggests a different interpretation, please let me know. On how much B12 to take Dr Michael Greger states: “For adults under age 65, the easiest way to get B12 is to take at least one 2,500 mcg supplement each week or a daily dose of 250 mcg. Note that these doses are specific to cyanocobalamin, the preferred supplemental form of vitamin B12, as there is insufficient evidence to support the efficacy of the other forms, like methylcobalamin. Dried green (Enteromorpha sp.) and purple (Porphyra sp.) lavers (nori) are the most widely consumed among the edible algae and contain substantial amounts of vitamin B12 (32 to 78 ug/100 g dry weight; Ref. 39). In Japanese cooking, several sheets of nori (9 3 3 cm; about 0.3 g each) are often served for breakfast. A large amount of nori (<6 g) can be consumed from certain sushi, vinegared rice rolled in nori. However, edible algae other than these two species contain none or only traces of vitamin B12 (39). Dagnelie et al. (53) reported the effect of edible algae on the hematologic status of vitamin B12–deficient children, suggesting that algal vitamin B12 appears to be nonbioavailable. As bioavailability of the algal vitamin B12 is not clear in humans, my colleagues and I characterized corrinoid compounds to determine whether the dried purple and green lavers and eukaryotic microalgae (Chlorella sp. and Pleurochrysis carterae) used for human food supplements contain vitamin B12 or inactive corrinoids. The scientists reviewed almost 100 scientific studies on the topic. They found that some highly touted sources of vitamin B12, such as blue-green algae called Spirulina that are sold as a dietary supplement, and some shellfish, instead contain high levels of a “pseudo” or “false” form of the vitamin that the human body can’t use. As little as 0.3 to 0.65 micrograms per day of vitamin B12 has cured people of megaloblastic anemia; however, to add an extra margin of safety I have recommended a higher dosage of 5 micrograms per day. You may be surprised to discover that you cannot purchase these tiny dosages. Supplements sold contain 500 to 5000 micrograms per pill. These exaggerated concentrations will correct by passive absorption B12 deficiency caused by disease of the intestine. Everyone else is being overdosed by a factor of 1000. If you are an otherwise healthy vegan and are using typical dosages of B12 (500 micrograms or more per pill), a weekly dose of this vitamin will be more than sufficient. You will often find B12 sold under its proper name. Because vitamin B12 contains one molecule of the mineral cobalt, the scientific name is Cobalamin. As a food additive and a supplement pill, vitamin B12 is usually found in the form cyanocobalamin. The effectiveness of this “cyanide complex” for treating neurologic problems has been questioned; therefore, other forms, such as methylcobalamin and hydroxycobalamin may be better choices for the prevention and treatment of B12-related conditions. Choosing a bioactive form of B12 is important. There are many B12-like substances called analogues found in food supplements, such as spirulina and other algae—these are ineffective and should not be relied upon. Foods fermented by bacteria, such as tempeh, and miso; as well as sea vegetables (nori), have been recommended as sources of B12. Miso and tempeh do not contain B12. Nori—the dried green and purple lavers commonly used to make sushi—has been tested and found to have substantial amounts of active vitamin B12 and has been recommended a “most excellent source of vitamin B12 among edible seaweeds, especially for strict vegetarians.” (Nori obtains its B12 from symbiotic bacteria that live on it.) However, there is still some uncertainty about nori as a reliable B12 source; therefore, I suggest if you do choose this seaweed that you should monitor your B12 levels by blood tests now, and if adequate, every 3 years. Vitamin B(12) concentrations of dried green (Enteromorpha sp.) and purple (Porphyra sp.) lavers (nori) were determined by both Lactobacillus leichmannii ATCC 7830 microbiological and intrinsic factor chemiluminescence methods. The values determined by using the microbiological method (63.58 +/- 2.90 and 32.26 +/- 1.61 microg/100 g of dry weight) were identical to those found by using the chemiluminescence method (69.20 +/- 2.21 and 25.07 +/- 0.54 microg/100 g of dry weight) in both dried green and purple lavers, respectively. A silica gel 60 thin-layer chromatography of both laver extracts shows that non-coenzyme forms (hydroxo and cyano forms) of vitamin B(12) predominate in both dried lavers. “The only reliable vegan sources of B12 are foods fortified with B12 (including some plant milks, some soy products and some breakfast cereals) and B12 supplements. Vitamin B12, whether in supplements, fortified foods, or animal products, comes from micro-organisms. – Take a weekly B12 supplement providing at least 2000 micrograms. From an article title “Eat Your Dirt: Vitamin B12” – some excerpts: “Many people believe that B12 only comes from animal flesh and animal secretions (i.e. cow’s milk, chicken eggs…) when in fact it is solely bacteria-based. Fungi, animals and plants are incapable of producing B12 on their own and must obtain it from outside sources. B12 is synthesized by bacteria and is therefore found in areas of bacterial growth, namely dirt and soil. Humans have been getting their B12 from the dirt for hundreds of thousands of years by eating plants that still had bits of soil on them. Today however, we wash our fruits and veggies so well (and understandably so) that we no longer consume dirt or proper levels of B12. That’s where supplements come in. B12 is easily produced through bacterial fermentation and can be safely made into a daily supplement. So here’s where it gets tricky for some: If we have to take supplements, then isn’t a vegan diet unnatural? Whether you get your B12 from a pill or from eating meat, you are most likely taking supplements, and here’s why… today’s meat industry has animals locked and caged inside warehouses (yes, some of which are labeled “organic”, “free-range” and “grass-fed”) and feeds the animals mixtures of corn and various byproducts and hormones which contain no natural B12. Like us, these animals need B12 to survive and therefore are given B12 as part of their supplements, which then ends up in their milk, muscles and eggs. Doesn’t it seem easier, more humane and more natural to just take a little bacteria-based pill yourself? She discusses some factors that could hamper absorption including alcohol, cooking and the use of antibiotics which contribute to “intestinal flora problems”. This site’s original 2012 page with excerpts from articles in science journals and news media about how what we choose to eat can: i) accelerate or slow down climate change and the related environmental catastrophes we face; and ii) increase or reduce our risks for chronic illness and disease. The evidence and body of opinion against the animal agriculture livestock industry is particularly compelling and damning.